Do you live in Stirling? (Scots: Stirlin; Scottish Gaelic: Sruighlea [ˈs̪t̪ruʝlə]) is a city in central Scotland. The city is clustered around a large fortress andmedieval old-town. Stirling is the administrative centre for the Stirling council area, and is traditionally the county town of Stirlingshire. The city is located several kilometres to the west of the mouth of the River Forth. Historically it was strategically important as the "Gateway to the Highlands", with its position near the Highland Boundary Fault between the Scottish Lowlands and Highlands, indeed, it has been described asthe brooch which clasps the Highlands and the Lowlands together..
Its historical position as the nearest crossing of the Forth to the river mouth meant that many of its visitors were in fact invaders. The beast of Stirling is the wolf, which it shares with Rome. According to legend, when Stirling was under attack from Viking invaders, a wolf howled, alerting the townspeople in time to save the town. It is also claimed that the last wolf in Scotland was killed in Stirling..
One of the principal royal strongholds of the Kingdom of Scotland, Stirling was created a Royal burgh by King David I in 1130, which it remained until 1975, when the burgh as an administrative unit was abolished. In 2002, as part of Queen Elizabeth II's Golden Jubilee, Stirling was granted city status. Stirling was originally a Stone Age settlement as shown by the Randolphfield standing stones and Kings Park prehistoric carvings that can still be found south of the town. The city has been strategically significant since at least the Roman occupation of Britain, due to its naturally defensible crag and tail hill (latterly the site of Stirling Castle), and its commanding position at the foot of the Ochil Hills on the border between the Lowlands and Highlands, at the lowest crossing point of the River Forth. It remained the river's lowest crossing until the construction of the Kincardine Bridge further downstream in the 1930s. It is supposed that Stirling is the fortress of Iuddeu or Urbs Giudi where Oswiu of Northumbria was besieged by Penda of Mercia in 655, as recorded in Bede and contemporary annals. A ford, and later bridge, of the River Forth at Stirling brought wealth and strategic influence, as did its port. The town was chartered as a royal burgh by King David in the 12th century, with charters later reaffirmed by later monarchs (the town then referred to as Strivelyn). Major battles during the Wars of Scottish Independence took place at the Stirling Bridge in 1297 and at the nearby village of Bannockburn in 1314 involving William Wallace and Robert the Bruce respectively. 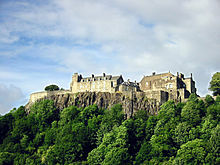 There were also several Sieges of Stirling Castle in the conflict, notably in 1304. Sir Robert Felton, governor of Scarborough Castle in 1311, was slain at Stirling in 1314. Standing near the castle, the Church of the Holy Rude is one of the town's most historically important buildings. Founded in 1129 it is the second oldest building in the city after Stirling castle. It was rebuilt in the 15th century after Stirling suffered a catastrophic fire in 1405, and is reputed to be the only surviving church in the United Kingdom apart from Westminster Abbey to have held a coronation. On 29 July 1567 the infant son of Mary, Queen of Scots, was crowned James VI of Scotland here. Musket shot marks that may come from Cromwell's troops during the Wars of the Three Kingdoms are clearly visible on the tower and apse. Another important historical religious site in the area is the ruins of Cambuskenneth Abbey, the resting place of King James III of Scotland and his queen, Margaret of Denmark. During the Wars of the Three Kingdoms, the Battle of Stirling also took place in the centre of Stirling on 12 September 1648. The fortifications continued to play a strategic military role during the 18th century Jacobite Risings. In 1715, the Earl of Mar failed to take control of the castle. On 8 January 1746 (OS) 19 January 1746 (NS), the army of Bonnie Prince Charlie seized control of the town but failed to take the Castle. On their consequent retreat northwards, they blew up the church of St. Ninians where they had been storing munitions; only the tower survived and can be seen to this day. Economically, the city's port supported overseas trade, including tea trade with India and timber trade with the Baltic. The coming of the railways in 1848 started the decline of the river trade, not least because a railway bridge downstream restricted access for shipping. By the mid 20th century the port had ceased to operate. The land surrounding Stirling has been most affected by glacialerosion and deposition. The city itself has grown up around its castle which stands atop an ancient quartz-dolerite sill, a major defensive position which was at the lowest crossing point on the River Forth. Stirling stands on the Forth at the point where the river widens and becomes tidal. To the east of the city the Ochil Hills dominate the skyline with the highest peak in the range being Ben Cleuch, although Dumyat is more noticeable from Stirling. The Ochils meet the flat carse (floodplain) of the River Forth to the east of the distinctive geographical feature of Abbey Craig, a crag and tail hill upon which stands the 220 ft (67m) high Wallace National Monument. The climate of Stirling differs little from that of much of the rest of central Scotland. The warm Gulf Stream air current from the Atlantic Ocean is the predominant influence, with a prevailing southwesterly wind. That said, the areas round Stirling Town Centre encounter significantly less snow in Winter than many of its very close neighbours such as Denny and Dunblane. Although this could be said as being anecdotal, it is likely to be because it is at a lower level and could be said to have its own microclimate.